For those with limited time who would like a less detailed glimpse of Oxford’s sights, the perfect answer is the one-hour tour aboard a classic double decker bus. Run by Guide Friday City Sightseeing Oxford, this open-topped bus tour gives a good overview of the city – quite literally! 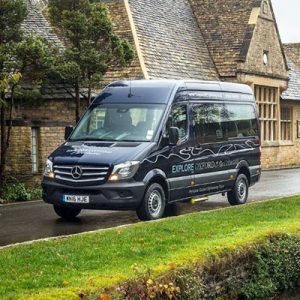 – and its route covers most of the main sights.You can either stay on board for the whole Oxford tour or you can get off at any one (or more) of the twenty stops to go exploring, and then get back on again when you want to discover somewhere else. Tours are guided by either an English-speaking guide or by tape. 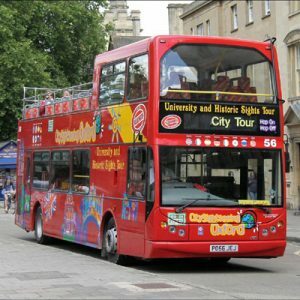 The tour runs every 15/20 minutes and leaves from various points in the city, including Oxford Railway Station, Gloucester Green Bus Station, Pembroke College and the Sheldonian Theatre. 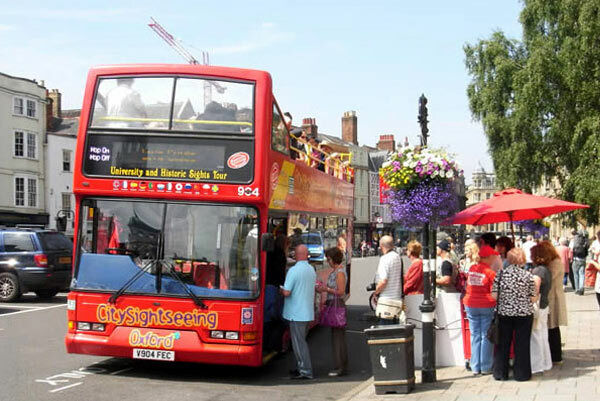 Prices for the open-topped bus tour of Oxford ccan be found on the City Sightseeing Oxford website. A private coach tour of the city can also be arranged for your group with a Blue/Green Badge City Guide. Your own coach can be used or, in the case of conference delegates and residential groups, coach hire can be arranged. The full City Historical Tour lasts approximately one hour and includes: Christ Church, The High Street, Magdalen College and Botanic Gardens, Magdalen Bridge, Science Area, Rhodes House, Sheldonian Theatre and Bodleian Library, Ashmolean Museum and Oxford Castle. If you would like to visit a College please allow an extra half an hour. Price: £90.00 (£100.00 including college visit). The City Tour can be combined with other tours to nearby sites of interest, such as . . . Spend the morning or afternoon visiting Blenheim Palace, home of the Dukes of Marlborough. This most spectacular of English houses stands within a former royal hunting park in the picturesque town of Woodstock, eight miles north of Oxford. 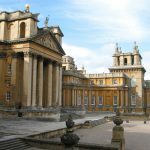 Henry II enjoyed secret meetings near the site of Blenheim Palace with the ‘Fair Rosamond’, and Elizabeth I was briefly imprisoned in the royal lodge at Woodstock. More recently, Sir Winston Churchill was born here, and is buried in nearby Bladon churchyard. The tour will allow you time to visit the impressive rooms inside the Palace as well as enjoy the superb park, landscaped by Capability Brown. Price dependant upon the extent of tour, and will be offered on application. 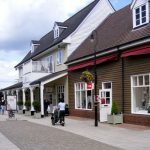 Visit the famous designer outlet shopping mall at Bicester Village (20 minutes from city centre). 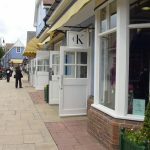 Enjoy browsing for designer bargains from names like Donna Karan, Burberry, Ralph Lauren, Escada, Karen Millen, Mulberry, Aquascutum, Calvin Klein, Waterford Wedgewood, The North Face, Samsonite, Gucci, Fred Perry, Yves Saint Laurent, Max Mara etc, and lunching/dining in a pleasant and relaxed atmosphere. A great day out for visitors who would like to combine a first class shopping experience with some sightseeing of our beautiful city and region. We can collect your group from the railway station at Bicester North and transfer you to Bicester Village Retail Park. Here, you can spend the morning browsing and shopping in the 130 shops and boutiques which make up this prestigious retail park. Just before your credit card starts to groan under the strain, we will collect you and take you on a sightseeing tour of the beautiful medieval city of Oxford (including a 1.5 hour walking tour of the city centre), or a visit to magnificent Blenheim Palace, the birthplace of Winston Churchill and residence of the Dukes of Marlborough. We can always make up a bespoke tour to suit you! Please note: Most of Explore Oxford Tours’ prices are based on group bookings. Although we welcome individuals who would like a private guided tour, it may be more cost-effective to form a group of like-minded Oxford visitors before making a booking.